An eye witness has told the Ballymurphy inquest about the last moments of several people, including a grandmother, the only woman to die in the shootings. John Maguire, also known as Stan, is now 84 years old. He described the shooting of victims Joan Connolly and Danny Teggart outside Henry Taggart Army base on 9 August 1971. 19-year-old Noel Phillips and 41-year-old Joseph Murphy were also killed. Ten people were killed during three days of gunfire in Ballymurphy in August 1971 in disturbances which followed the introduction of internment. Mr Maguire explained that he had been talking to friends on the Springfield Road that evening when shooting broke out from paratroopers at the base across the road. There were two nearby army bases, Vere Foster School, and a commandeered Presbyterian Church Hall, the Henry Taggart Memorial. Soldiers from the parachute regiment were stationed at the hall. Mr Maguire says he took cover behind the white pillars at the entrance to an area of waste ground where there had previously been a Presbyterian Manse. He said 44-year-old Danny Teggart had decided to run across the waste ground and was shot in the back, pitching forward as he fell. He said Mr Teggart had been unarmed, and that he had not seen any one else with a weapon either. He also said he could see Joan Connolly lying after she was hit, and had heard her crying ,"I can't see, I can't see". He thought her voice had weakened and that she lost consciousness shortly afterwards. Mrs Connolly, a 44-year-old mother-of-eight, had been shot in the face. Mr Maguire told the inquest a friend, Tommy Delaney, put a white hanky on a stick and start waving it, but the shooting continued. He also saw another figure on the far side of the waste ground fall though a hedge as it was shot. Mr Maguire said after a while an army Saracen armoured vehicle drove through the gates into the field. He said a soldier with a red beret got out of the vehicle and fired a sidearm in the direction of him and others lying with him at the gate pillars. The witness added that when the soldier moved in their direction, he decided to make a run for it through a hole in the hedge. He told the court: "I though he was going to pick us off. I was very frightened." He ran to a nearby house and went in, staying there for the rest of the night. Mr Maguire was later questioned about differences in statements he had made about the shootings over the years. 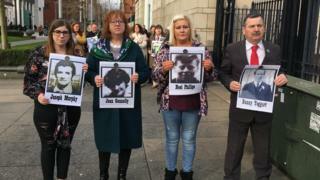 Former soldiers are also due to give evidence about the first day of the shootings in Ballymurphy in the coming days.